15 Euros for adults & 10 Euros for under-16s. Battles will take place in a specially-constructed polycarbonate arena, 20 metres squared and 6 metres high – ensuring a great view of even the smallest and speediest fighter drones. Flame throwers and water cannons. Ballistic balls and entangling nets. Devilishly fast fighter-drones and majestically defended Queen drones. This high-stakes live experiment of the latest in counter-drone technology is set to be …smoking! Don your white hat and try your hand at hacking down a TinyWhoop drone. Sign up for the hacking challenge when you buy your tickets. Alternatively bring your own (safe) counter-drone prototype and test it out in the interval. 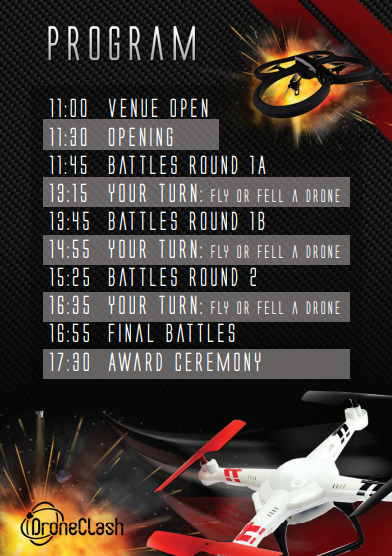 Alternate adrenaline-inducing DroneClash battles, with an informative stroll around the ClashExpo to meet businesses developing new counter-drone technology. Whether you are flying drones or simply spectating, it’s thirsty and hungry work. Recharge your batteries at our food trucks, provided by Veul Soeps.